As I started to scan the Norwich Historical Society’s collection of street scenes, the names of streets I looked through were mostly familiar- Beaver Meadow, Bragg Hill, Union Village, Hazen… I know there are a few more remote ones here or there that I may not have heard of– the quiet, out of the way roads that meander through the hills, rarely used except by their residents. 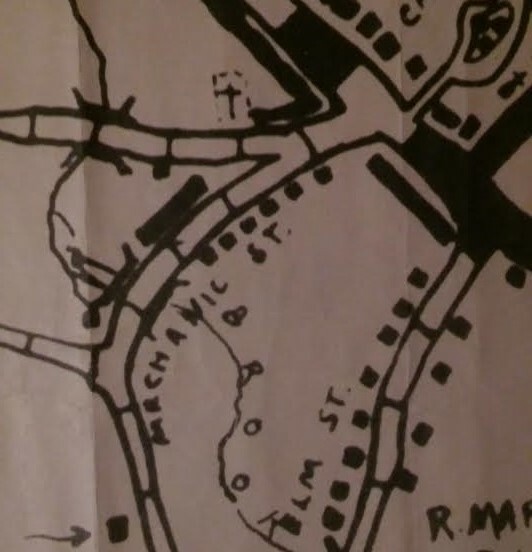 While Mechanic Street could not be found on Google Maps, a look at the maps in the Historical Society’s collection revealed the location of the mysterious road: what is now the beginning of Beaver Meadow Road and Hopson Road was once Mechanic Street. Although Mechanic Street no longer exists, it once held an important role in town. As its name suggests, many of its residents were manual laborers and repairers of machinery. The 1869 Beers Atlas in the Historical Society’s collection reveals two blacksmith shops (BSSh) in the vicinity of Mechanic Street. There was also a third blacksmith shop on the street that is unmarked on the map, owned by George W. Sturtevant, a fact revealed in the 1870 Census. The Census reveals a rich picture of what it would be like to be transported to nineteenth-century Mechanic Street– you would find yourself on a busy dirt road lined with houses and shops. The residents of Mechanic Street, some of whom had moved to Norwich from places such as New York or Canada, would be at work. You would hear the anvils ringing, the saws cutting, and hear others talking as they headed off to work on the railroad. The blacksmith shop at the fork in the road became a frequent subject for postcards of Norwich in the early twentieth century, celebrating that it had been in use for about one hundred years. Today Hopson Road goes to the left of this image while Beaver Meadow Road goes to the right, just visible behind the shop, while behind the shop is the Fairview Cemetery. While this blacksmith shop lasted for about a century, it was torn down in 1914, and the road was paved and eventually renamed. Although Mechanic Street is no longer a feature on the map of the roads of Norwich, it was an important place for generations of Norwich residents where horses could be re-shoed, tools could be repaired, carriages could be made, and artisans could make a living.